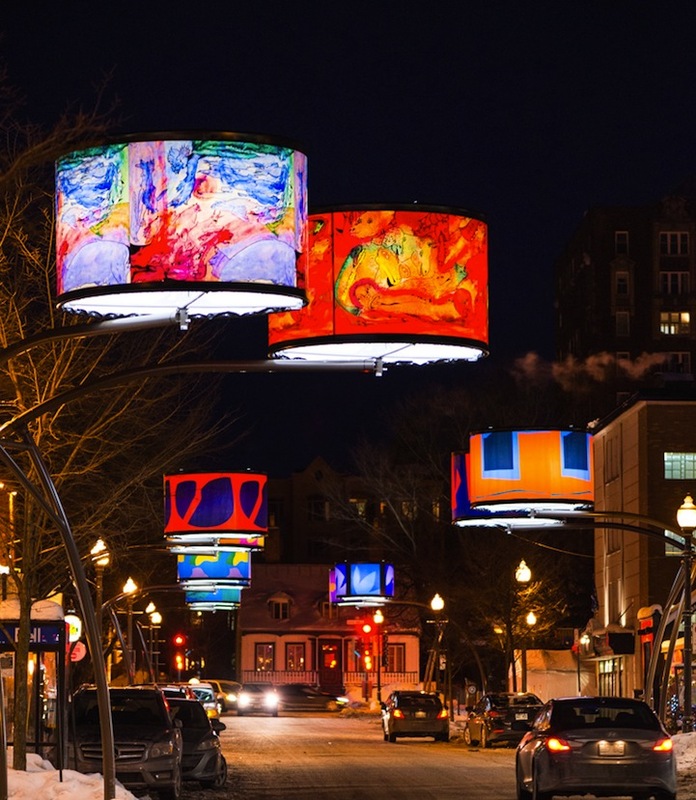 Currently on Cartier Avenue in Quebec City, 34 giant backlit lampshades, decorated with selected works by Alfred Pellan and Fernand Leduc from the Musée national des beaux-arts du Québec, are hanging over the street. 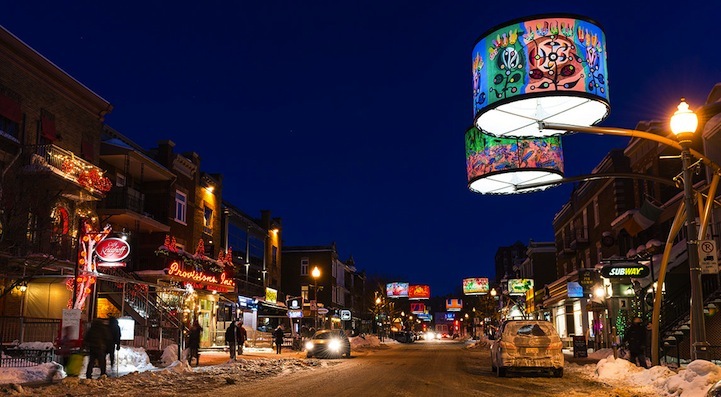 Quebec City receives a splash of color and coziness for one of its streets with a temporary installation of art-inspired lampshades. 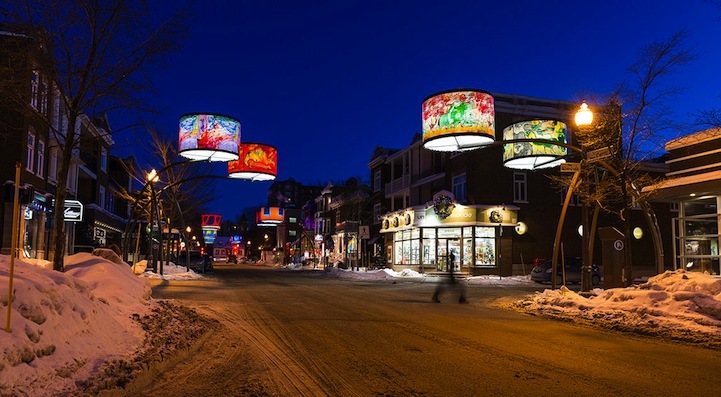 Conceived from the idea of neighbourhood life, Montreal-based light design companyL ightemotion developed a concept of an art gallery floating in space. 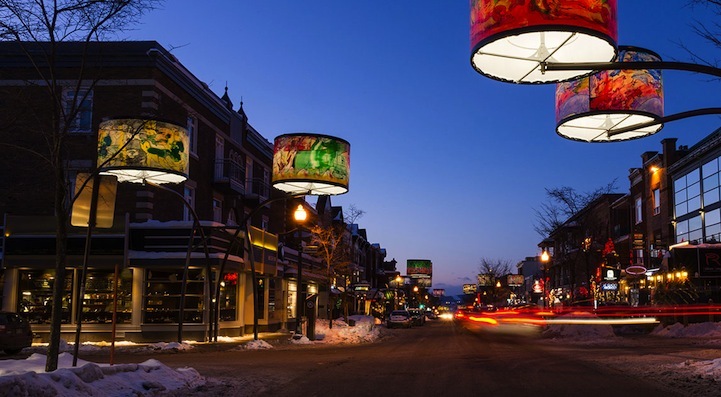 The 34 uniquely designed lampshades line a section of Cartier Avenue, warmly illuminating the city’s wintery landscape. The lamps blend beautifully with light from the street’s traditional lampposts and traffic lights while giving the storefronts a distinctly artistic feel. The installation is an original concept by lighting design firm Lightemotion. The designs were accomplished by transferring works by two Québécois painters , Alfred Pellan and Fernand Leduc, onto the lampshades. Lightemotion realized the concept in close copperation with the city’s major museum of fine arts, the Musée national des beaux-arts du Québec. The museum selected works by Alfred Pellan and Fernand Leduc from its permanent collection and handled artistic direction for their reproduction on the giant lighting fixtures. While the winter exhibition is designed to be temporary (it is scheduled to continue until the end of March), Lightemotion’s creation has the advantage of being flexible. The works mounted on the shades can be easily interchanged, giving the city the ability to set up more displays with different artists in the future. 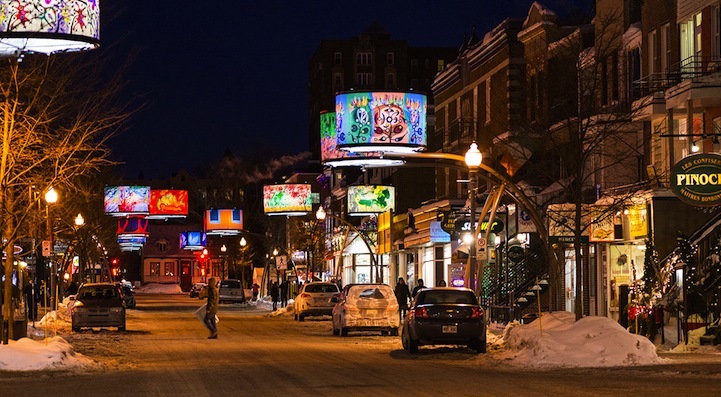 “Our major challenge was to respect the soul of Cartier Avenue, while being bold enough to create a world-class project that would help make Quebec City a true international winter capital,” said François Roupinian, founder and president of Lightemotion. Conceived from the idea of neighbourhood life, Lightemotion developed a concept of an art gallery floating in space, which could inspire many more such projects around the world.